The Algo Variable pane allows you to modify algo variables, create templates, and launch deployed algos that you have selected in the Algo Explorer pane. The Algo Variables pane displays two types of algo variables: algo specific and common variables. Added with ADL at design time and can include such things as order quantity or instrument. Order routing credentials can be specified for each Instrument Block. Select the desired algo (or algo template) in the Algo Explorer pane. This displays the algo variables in the Algo Variable pane. Tip: Rather than typing a static variable, you may paste link a variable from Excel. 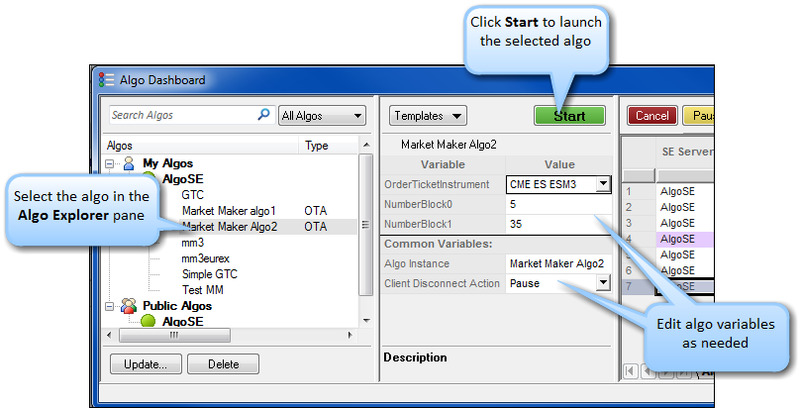 Click Start to launch the algo. Upon successful submission to the Algo SE server, the Algos Orders pane displays the algo order in the Running state. Warning: Users with whom you share an order book may not have the same product permissions. Attempts to launch an algo containing an instrument for which they are not permissioned will be rejected and display a reject message in the Audit Trail. Once the algo instance is started, the Algo Dashboard displays the algo in the Algo Orders pane. The table shown below describes the default columns displayed in the Algo Orders pane. Note: If an Order Management Algo (or OMA) is applied to the child of an algo, the child of the OMA is not counted towards the algo number of orders. Like other trading windows in X_TRADER, you may display additional columns in the Algo Orders pane by selecting Show/Hide Columns from the right-click context menu. The table shown below describes some of these optional columns. Note: This key is the algo parent order's TT Order Key, a unique key that does not change during the life of the algo parent order.